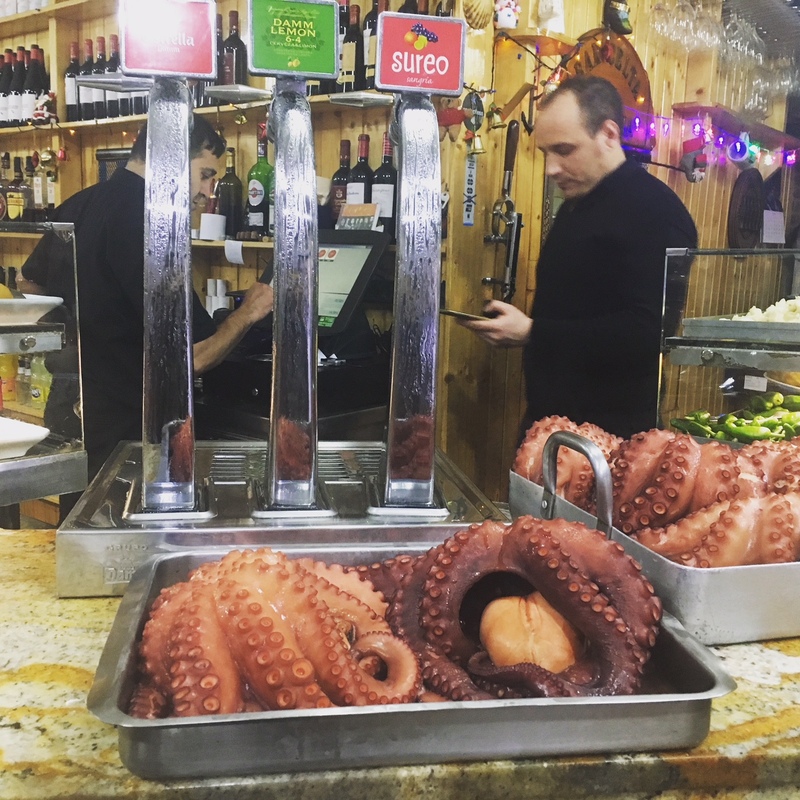 Whether it’s fried squid in the south or a cooked suckling pig in Madrid, Spain and its cuisine have long been an interest of mine. 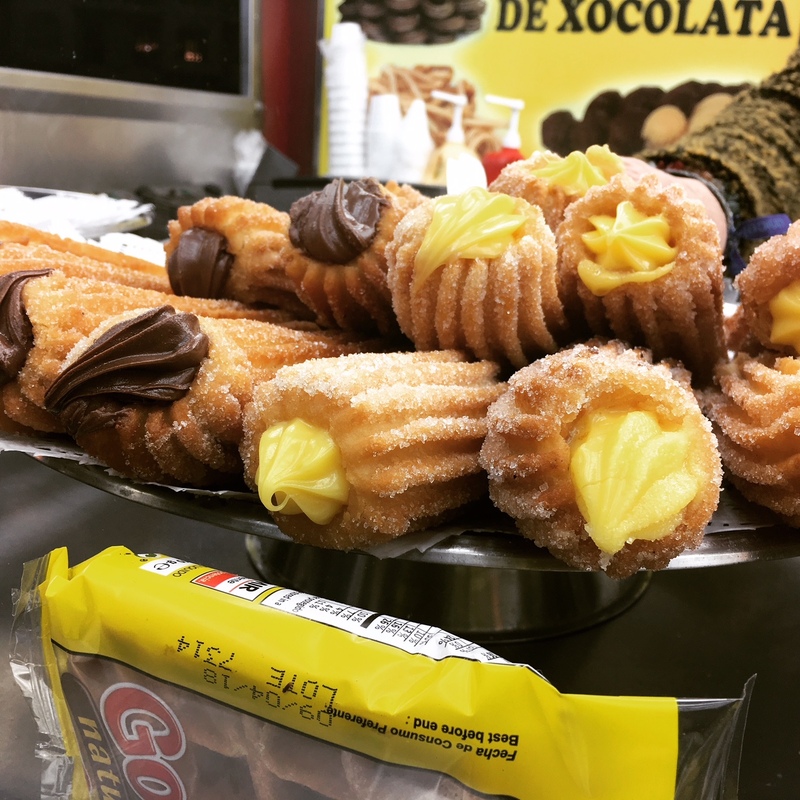 Escaping London for the New Year, my boyfriend and I headed off for four days holiday in Barcelona, where I had more than ample opportunity to eat and drink the cities edible offerings. No sooner had we stepped off the airport bus than we were already chowing down on some churros. Expertly fried to be crunchy rather than greasy and generously filled with creme patisserie, this street snack was just a small amuse bouche for the great things to come. Whoever coined the phrase less is more must have been a fan of pan con tomate, or pa amb tomaquet as it’s known in Catalan. This simple snack is my favourite Spanish breakfast and consists of, as the name might imply, bread with tomato. The addition of olive oil, salt and sometimes garlic bring it together, but all in all this dish is a simple as it gets. 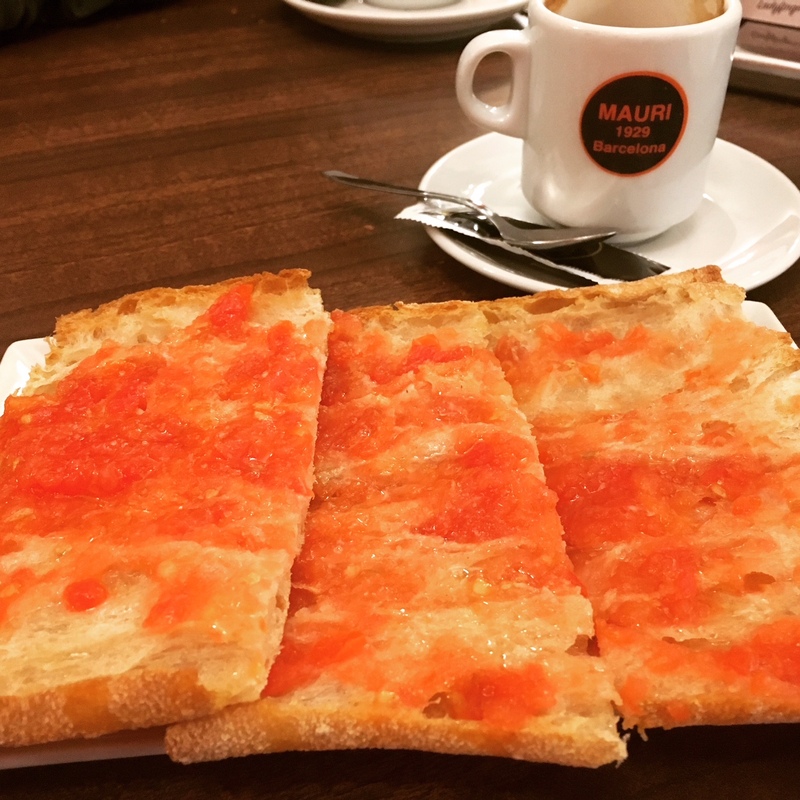 Breakfasting at the beautiful cafe Mauri in the Eixample neighbourhood, I had all the pan con tomate my heart desired (three pieces no less). Washed down with a cafe cortado, I was set to start the day. 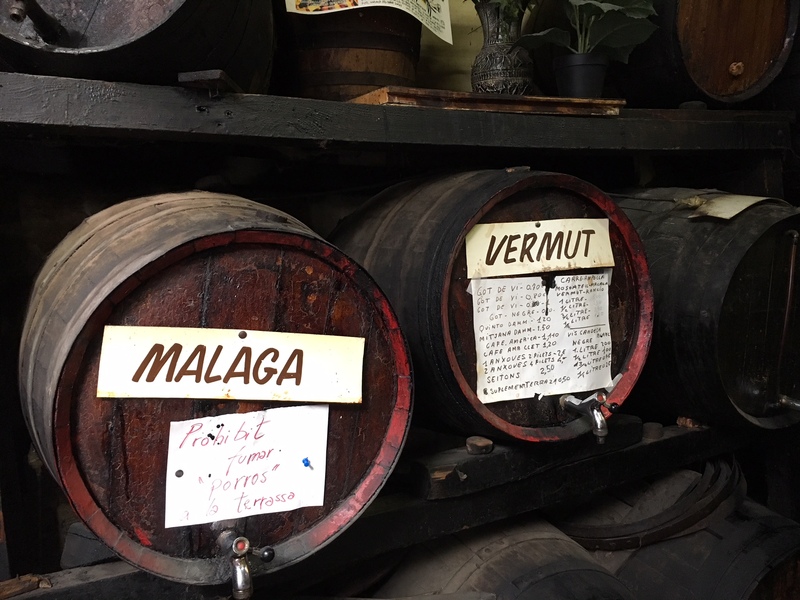 While the Spaniards love a caña (a little less than half a pint of beer, drunk at pretty much any hour of the day), they’re also partial to a bit of vermouth. A sweet and aromatic fortified wine which was once the drink of elderly gentlemen, it’s now become extremely popular, with trendy new vermuterias popping up all over the city. Far from modern (it’s positively ancient), you have Bar Montse, tucked away in the Barrio Gótico. Barrels of homemade vermouth sit opposite walls of spirits and liqueurs covered in cobwebs. Not so appetising to eat in, but wonderfully atmospheric for a quick drink to quench the sightseeing induced thirst, here we enjoyed a little vermouth sat on one of the tables outside. 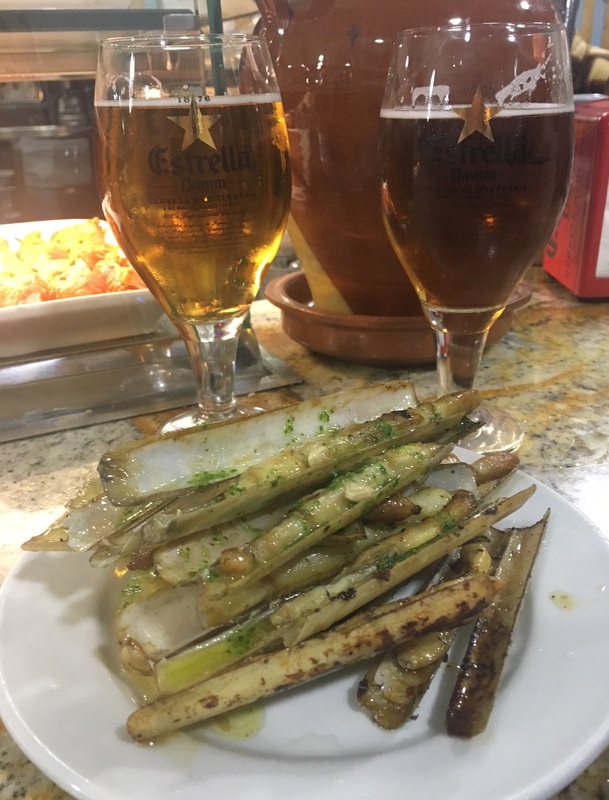 For lunch, we headed to Bar Celta, a small pulpería in Barceloneta which specialises in, you guessed it, pulpo (squid en inglés). Fish and seafood make up the majority of the menu, but tempting meat options such as my favourite blood sausage morcilla serve to please the fish-fearing customer amongst us. Ignoring the meat (minus some delightful ham croquettes to start with), we honed in on the seafood; grilled prawns, steamed razor clams and of course, squid. 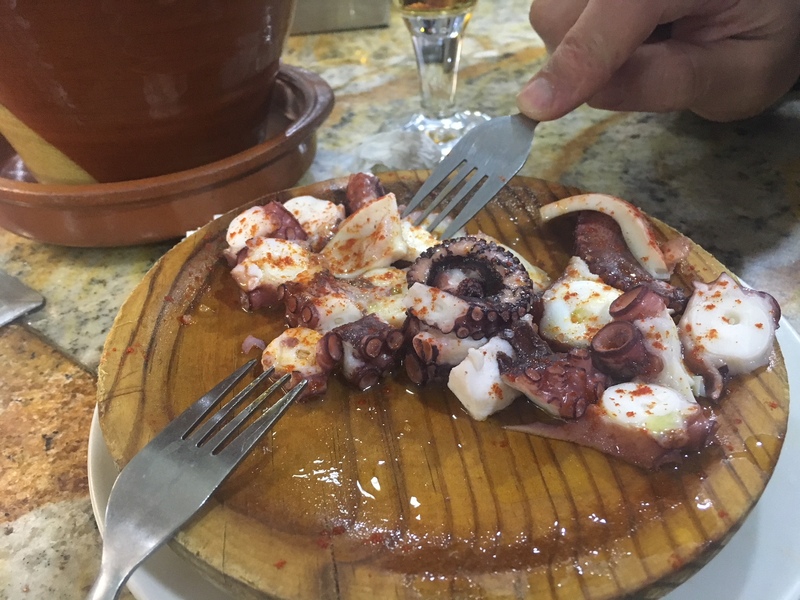 Normally served on a bed of potatoes, at Bar Celta this came carb-free, meaning with the focus on the tender squid itself. A dusting of paprika on top served to boost its smoky flavour. The prawns and razor clams both came steamed and then grilled, topped with buttery parsley sauce. Again – sometimes, simple is best. Visit here for some fresh Spanish food and service with a smile. 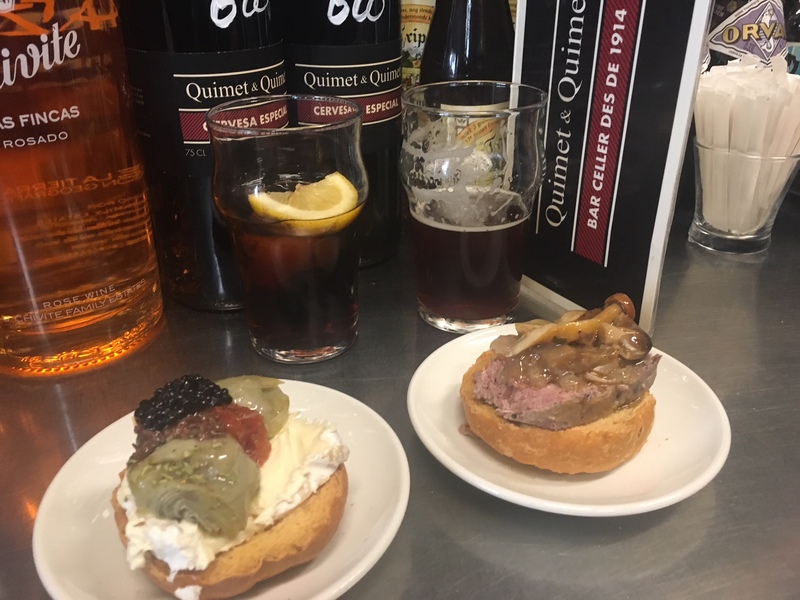 Located in the San Antoni neighbourhood is vermouth bar and all round top snack joint Quimet & Quimet. Don’t expect to find a seat – this is prop yourself up on the bar and eat with your hands kind of venue, serving small tapas and high quality montaditos – rusky rounds of crunchy bread come topped with meat, fish, and often both together (you’ll find veggie options too…if you look hard enough). Vermouth in hand, I was ready to eat. The tangy artichoke mixed with the creamy cheese, sweet tomato and intensely savoury caviar was a well-thought out combination of flavours. This savoury and sweet mixture also featured in the meat montadito; a rich pâté with smoked mushrooms, drizzled with a honey dressing. For when the midday meal calls for something more substantial, a menú del día is the perfect option. Three courses and a drink normally come in at around 10-13 euros, and if you seek them out these can be some of the best meals around. One such restaurant offering a brilliant menu is Transatlantico restaurant. First dishes varied from traditional Catalan meat and potato soup (escudella) to cauliflower cheese; the options for the second dish range from cod right through to horse. Eschewing all things equestrian and sticking to more familiar foods, I chose a stuffed aubergine for starter, but quickly got food envy of all the paella that was coming out of the kitchen. Wondering how greedy it’d be to convert my three-course lunch into a four plate affair, I asked about the option of adding on an extra paella. It’d cost me all of 4 euros… I was sold. 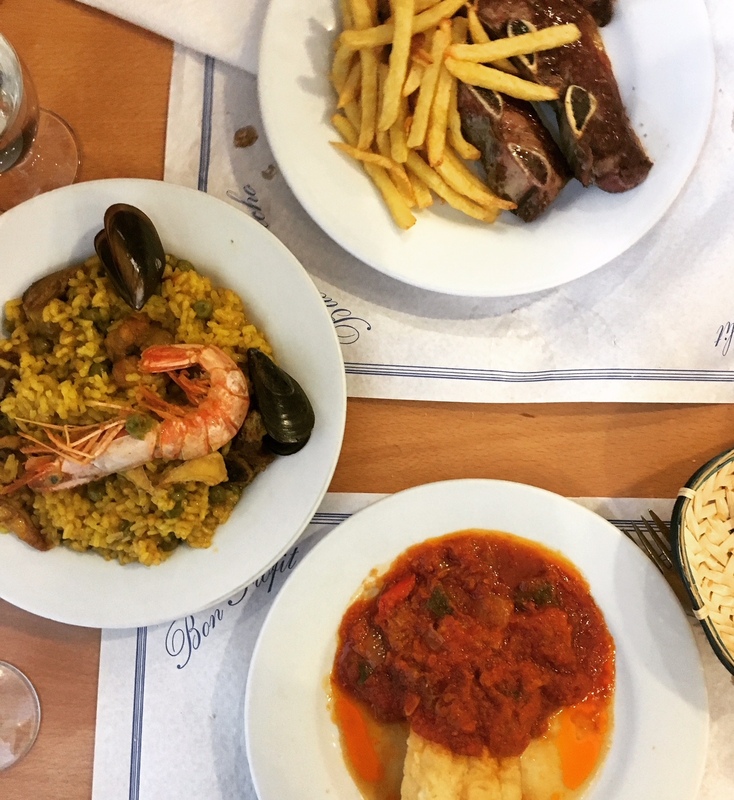 My boyfriend chose beef ribs and chips (because too much seafood is against an Argentine’s DNA), while I had cod with pisto, basically a Spanish ratatouille. 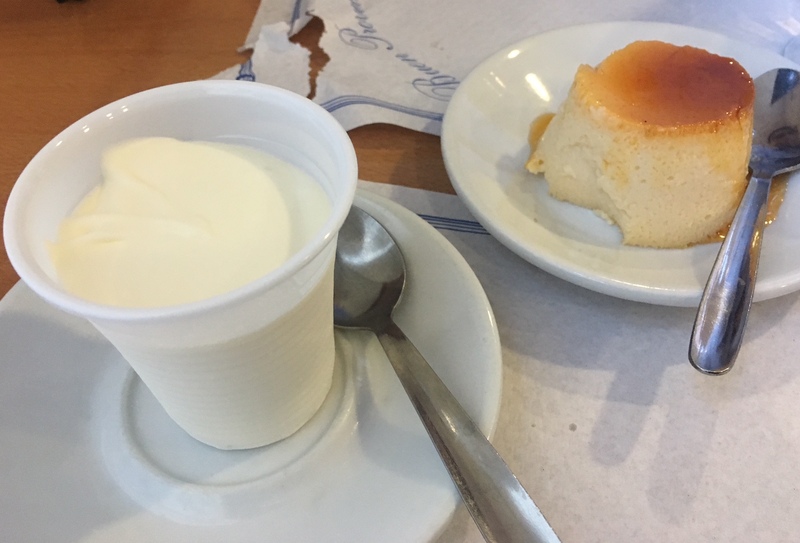 Pudding was a wonderfully retro affair, with a flan and a sweet cheese mousse, which was so good it made me think it was probably just pure Philadelphia cheese and whipped cream. Bliss. During our time in the city, we ate and drink like royalty for just a fraction of the price we would have in London, and were left hungry for more. My love affair with Spain will continue, which is just as well…I’m not full yet, and I’ll be back.